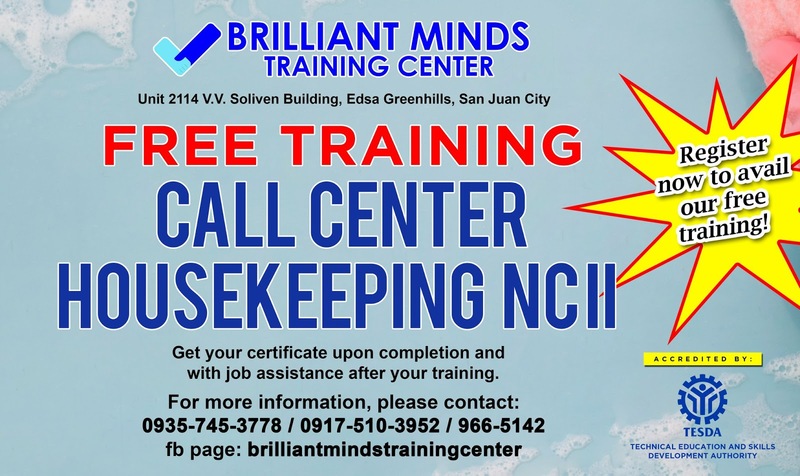 You are here: Up-daily » Tesda » Free Call center and Housekeeping NC II training! Get your slot now! Willing To Be Trained, Grow And Get A Job! 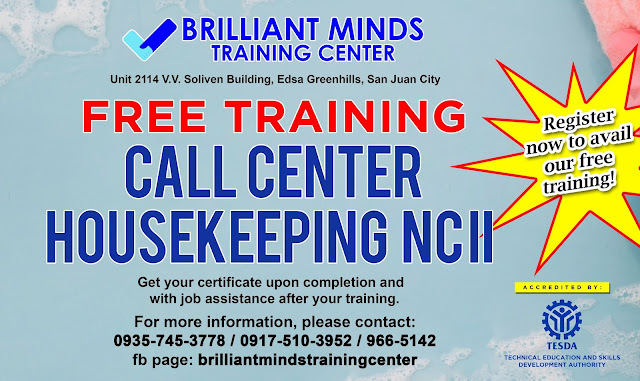 Greenhills, San Juan City - Hello guys, We would like to inform you that the Brilliant Minds training center is inviting you to their Free Call center and Housekeeping NC II training! Get your slot now! and Trained today! "Get your certificate upon completion and with job assistance after your training." What are you waiting for!!! Hurry up!!! Limited Slots Only!!! For more inquiries please visit Brilliant minds training center at unit 2114 V.V. Soliven Building, Edsa Greenhills San Juan City or you may contact this following numbers 0935-745-3778 / 0917-510-3952 / 966-5142 or message them on their facebook page brillianmindstrainingcenter.